Wondering whether to get Panasonic HDC-TM900 or HDC-TM700 as your new HD camcorder? Panasonic HDC-TM900 is the latest camcorder which is equipped with 3D Conversion Lens to capture 3D movies with side-by-side method. However, the 3D technology is not as popular as the AVCHD recording tech. There still some time for checking the 3D technology. Besides 3D movie, TM900 also records 2D videos. For the video professionals and users would like pretty high quality, Panasonic provides more advanced 3MOS system and image stabilization system in TM900. TM700 is a professional camcorder in customer level, while TM900 takes a further step to professional image and video capturing. If you would like to put the AVCHD videos from TM700 or TM900 to Final Cut Studio for editing, a third party software shall be needed to handle the 1080/60p and 1080/50p footage to ProRes 422 for FCP 6/7. UFUSoft AVCHD Converter for Mac is the recommended Panasonic TM900 AVCHD to ProRes converter for high quality video editing on Mac with less compressed Apple ProRes format. 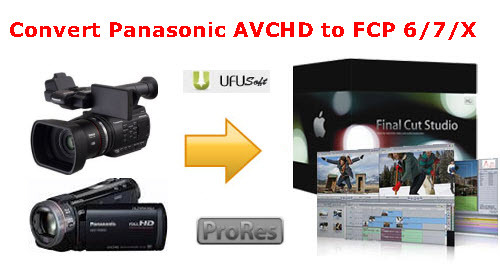 Below is the fast guide for you to convert HDC-TM900 and TM700 AVCHD to ProRes 422 for FCP 6/7. Step 1. Upload Panasonic footage to Panasonic AVCHD Converter for Mac. Use USB cable to connect Panasonic camcorder to iMac/MacBook Pro, run UFUSoft AVCHD Converter for Mac as the best 2013 AVCHD TM900/TM700 to ProRes 422 converter on Mac 10.8 Mountain Lion, Mac 10.7 Lion, Mac 10.6 Snow Leopard, 10.5 Leopard and 10.4 Tiger. Click the “Add” button to import .mts files from camcorder to the converter. 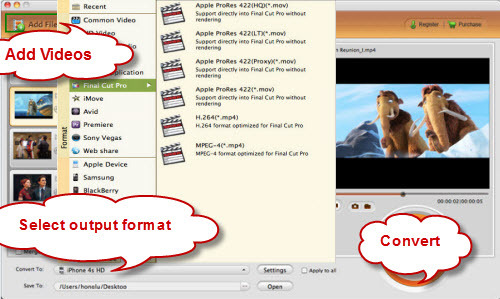 Click the “Format” option, and move mouse cursor to Final Cut Pro > Apple ProRes 422(HQ) (*.mov) as output format. Click the “Settings” button and choose 1920*1080 from the drop-down box of video size to keep HD resolution. Step 3. Convert Panasonic TM900/TM700 AVCHD video to MOV with ProRes for FCP 6/7. Click the convert button under the preview window, the Mac Panasonic AVCHD converter will start converting 1080/60p and 1080/50p AVCHD footage to ProRes 422 for FCP 6/7. After the conversion from TM900/TM700 60p/50p to ProRes 422 HQ for FCP, you can import the output .mov files to Final Cut Studio for editing.